YAY! I was so excited to see this month’s Judged Photo Theme as “Pet Faces!” If you know me, then you have probably seen countless pictures and have heard endless stories about our awesome cat, Oreo. Last week, it was so hot here in Oklahoma that my sister and I successfully baked cookies in the car (for the full blog post, click here). While we were on our way out the door, Oreo insisted on checking out the cookie dough. She is so curious – a typical cat. But unlike most cats, she enjoys eating human food. She made a sure attempt to taste the cookie dough. Can you blame her? Who doesn’t enjoy a good spoonful of cookie dough every once and awhile? I love this picture, and I’m so excited to see all of the other pet face entries! Check out the other entries on I Heart Faces by clicking here. You can also learn more about Oreo the Cat by checking out her Facebook page here. how cute! I baked cookies in my car 2 years ago. My car smelled great for weeks! Awesome! Glad to know I’m not the only crazy one who has tried baking in the car! Thanks for checking out the post and for the comment! How did the cookies turn out? Cute inquisitive kitty- great shot! Hey Sarah! The cookies turned out great! You see a blog post I wrote about it by clicking the link above that says “for full blog post, click here.” My husband absolutely loved them and couldn’t stay away from them. 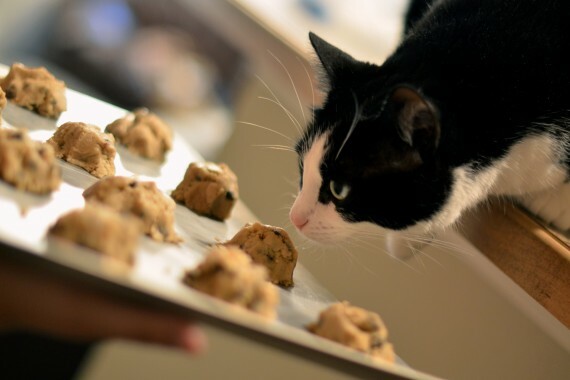 Well, of course a cat named Oreo would be all about tasting the cookies! Cute capture! Thanks for the comment, Tezzie! Now that I’ve finally figured out that her name Oreo is the link to why she likes cookies, I’ll just need to figure out what it is about her that makes her like Queso dip and Ranch dressing! YES! They were delicious! Thanks for the comment!